Awful results: Top, push, dead ball. Magic move: Hand-hit out of "eternal triangle," letting COAM take its course. Check points: A good follow-through. Once the golf swing gets down to the so-called hitting area correctly, the chance of its going wrong is very slight. That is because, as we have mentioned, the swing through the ball is only a continuation of the first movement of the downswing, the movement that brings us to the hitting area. By the same token a golf swing which reaches this area in the wrong position has no chance to get straightened out. Yet, golf being the strange game that it is, there is still the possibility of the good golf swing going off the track at this late stage. In both the good swing and the bad, though, when the flaws appear they appear for basically the same reason-trying to "help" the club head get to the ball. 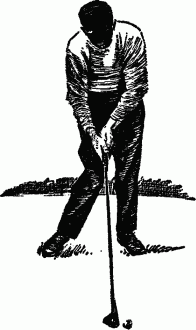 They will appear in the good swing when the player loosens his left-hand grip slightly and collapses his left elbow. As the result of these actions there comes a peculiar body movement, a sort of heaving action, as though the player were trying, with the body, to help the swing or help hit the ball. It is a very strange contortion indeed. Women, especially, are given to it. In this movement the loosening left-hand grip and the collapsing left elbow have the effect of bringing the club up sharply instead of letting it go down and through the ball as it should. The left elbow crooks and bends out to the left, toward the target. This suddenly shortens the radius of the golf swing, and since the straight left arm has been performing the function of a constant radius all through the swing, there is nothing for the club to do but come up. The horrible result is a badly topped shot. The golf club, coming up at impact, makes contact on or above the horizontal center line of the golf ball, the ball's "equator." "The swing through the ball is only a continuation of the first movement of the downswing, the movement that brings us to the hitting area." How badly the shot is topped depends only on how much the golf club is brought up by the elbow action and the shortening of the radius. It is a dead certain way to bounce or dribble your shot into any brook, pond, or ditch that happens to be immediately in front of you. If the golf swing happens to be from the inside, the loosening left hand and automatic strengthening of the right hand will cause the ball to be hit out to the right — a push. It may be a topped push or, if the club isn't brought up far enough to make it top the ball, just a push. There is usually trouble to the right on any shot, as every slicer knows, and it doesn't make any difference whether we slice the golf ball into that trouble or hit a straight ball into it. It still costs strokes. A third possibility these flaws may lead to, if they are slight rather than pronounced, is a straight ball that doesn't go anywhere—a dead ball. This, of course, is caused by the loosening of the left-hand grip. The strong connection between the motive force of the arm and the club that is being motivated is weakened. The connecting link (the hand) gives slightly at impact and force is lost. We have played with club members who have made this very complaint: "I hit the ball square but it doesn't go anywhere. I must be getting weak." They are not getting weak. George Bayer could get the same kind of a shot, relatively, if he loosened his grip as he came into the ball. Golf Swing "Throught The Ball": The Right and the Wrong Way to Hit the Ball.